An effective partnership between a family and a pediatrician depends on good communication. One of the most valuable services a pediatrician can provide a child and family is his/her experience and skills in eliciting a history to diagnose and treat a problem and in sharing health information to educate and empower patients and families. Communication tasks that a practitioner performs may range from explaining a diagnosis or test results to obtaining informed consent from a literacy-challenged parent for a medical procedure to listening to and counseling a distraught teenager. 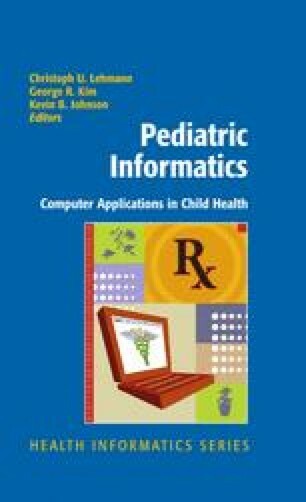 Information and communication technology (ICT) can provide both benefits and tradeoffs to patients, parents, and pediatricians. For families, telephone, fax, and electronic mail with their health care providers may provide flexibility, speed, and ease in exchange for the reassurance and other nuances of direct contact with a trusted provider. For pediatricians, ICT may increase access, but must be managed to prevent overload and to maintain quality of care and clinical and fiscal productivity. American Academy of Pediatrics Section on Telehealth Care. Payment for Telehealth Care. American Academy of Pediatrics Website; 2006. Available at: http://www.aap.org/sections/telecare/reimbursement.htm. Accessed December 4, 2008. Liebhaber A, Grossman JM. Physicians Slow to Adopt Patient E-mail Data Bulletin No. 32. Center to Study Health System Change; 2006. Available at: http://www.hschange.com/CONTENT/875/. Accessed December 4, 2008. American Academy of Pediatrics, Division of Health Policy Research. Periodic Survey of Fellows 51: Use of Computers and Other Technology, Executive Summary. American Academy of Pediatrics; 2003. Available at: http://www.aap.org/research/periodicsurvey/ps51exs.htm. Accessed December 4, 2008. American Healthcare Information Community (AHIC). Chronic Care Workgroup. Department of Health and Human Services Website; 2008, last update. Available at: http://www.hhs.gov/healthit/ahic/chroniccare/. Accessed December 4, 2008. Medem. Medem Website; 2008. Available at: http://www.medem.com/am/am.cfm. Accessed December 4, 2008. American Academy of Pediatrics. Patient Education Online. Commercially available from the American Academy of Pediatrics; 2008. Available at: https://www.nfaap.org/netforum/eweb/DynamicPage.aspx?webcode=aapbks_productdetail&key=53c87c6f-6dee-4a01-aebb-e1a5b9a8e60f#. Accessed December 21, 2008. National Library of Medicine. MedlinePlus; 2008. Available at: http://medlineplus.gov/. Accessed December 4, 2008. Centers for Disease Control and Prevention. CDC Website; 2008. Available at: http://www. cdc.gov. Accessed December 4, 2008. Food and Drug Administration. FDA Website; 2008. Available at: http://www.fda.gov/. Accessed December 4, 2008. Merck and Co. The Merck Manual Online; 2008. Available at: http://www.merck.com/mmpe/index.html. Accessed December 4, 2008. Medem. Disease Management and Adherence Programs. Available at: http://www.medem. com/node/1098. Accessed December 21, 2008. Medem. Secure Messaging and Online Consultation; 2008. Available at: http://www.medem. com/node/1088. Accessed December 21, 2008.